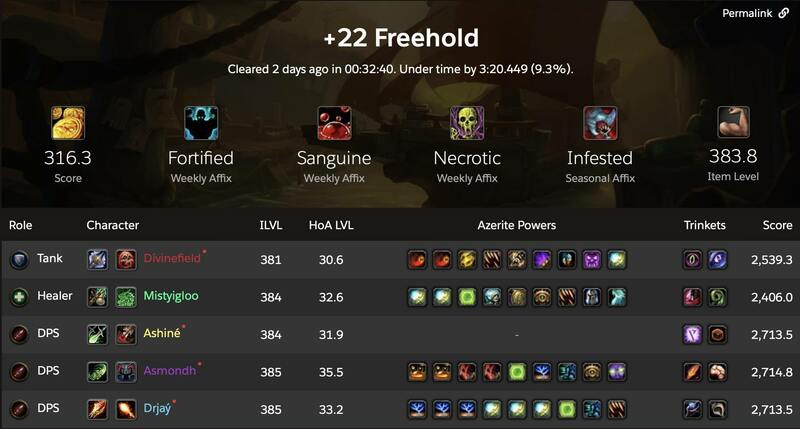 With an average item level of 383.8, Ashine, Drjay, Divinefield, Mistyigloo, and Asmondh managed to clear Freehold +22 in 32 minutes and 40 seconds. Congratulations! Another world first has been claimed recently, as Ashine, who's in charge of the Subtlety Rogue guide here at Icy Veins, cleared Freehold +22 in time with his group. Here's a video of the clear taken from Drjay's stream. Click the image below for more details about the run. I bet that 370 gear feels nice.